I thought it was time for me to update my glasses! I had the same glasses since junior year of high school which was like five years ago! 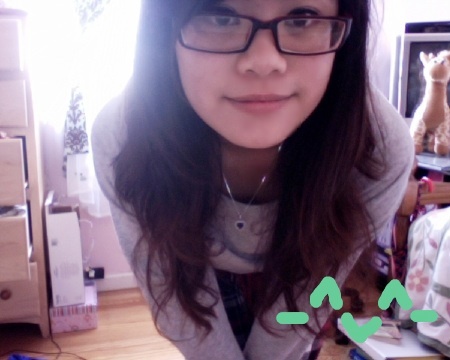 In fact, I have a photo immortalized on my tumblr of the day I got my old glasses! It's really embarrassing, but now I sort of feel like sharing these photos on this blog xD! In high school, I HATED the way glasses looked on me! 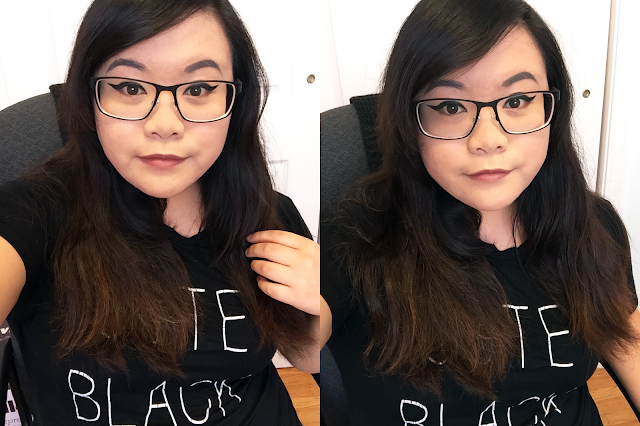 I had cornea problems caused by complications from my contacts which forced me to wear glasses for a whole year! It made me feel really self conscious. All my feelings came from my experience of wearing glasses in elementary school. When I was in first grade, I picked out these really cute baby pink glasses. I thought they were so cool! I couldn't wait to wear them on the first day of school. However on my first day, one of the older kids said my cute glasses looked like "Harry Potter glasses" and it made me feel sad. Then I vowed to get contacts once I got old enough ( * ^ * )! I sort of feel indifferent about wearing glasses now. I need them to see at night time when I take off my contacts. To be honest, I still don't think glasses look good on me, but I don't really mind having to wear them! If someone told me my glasses look like "Harry Potter glasses" now, I think I'll thank them and take it as a compliment considering how much money the HP franchise made! Haha. 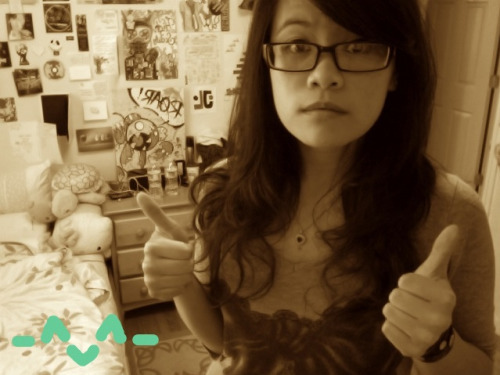 Now here is a plethora of old photos of me wearing glasses from oldest to more recent :P! I think this photo was taken when I first discovered how the webcam on my macbook pro worked! The photo quality is terrible xD! The usage of "its" is also incorrect. 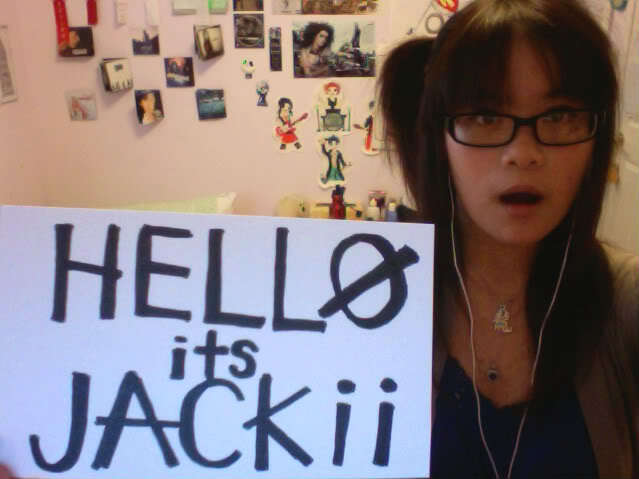 Also I had to write the "Hello its Jackii" backwards in order for it to show up correctly in the photo! Now that I look back at this photo, I sort of chuckle considering how cool I thought I was. I vaguely remember that point in my life where I was obsessed with plaid shirts. I think most of my closet consisted of black trench coats and plaid. Also I wore that skull bracelet all throughout middle school and high school until it broke. Fun fact: the bracelet was Eduardo's belt from Foster's Home for Imaginary Friends! I used to be obsessed with that show back then! My hair is also ultra oily for some reason. At least the hair cut looked pretty good back then! I still think my teeth look ultra straight in this photo :)! If click the link, you'll know what I'm talking about! Haha! This is one of those rare photos of me on the internet where I'm not wearing any makeup. Surprisingly, it looks okay in this photo! Also I'm still wearing that purple heart necklace to this day! I remember this day because I was extremely depressed. I didn't go to school for a week and I contemplated dropping out. My friends all messaged me asking where I was and I didn't know what to tell them. I don't know if I used my webcam to take this photo or if it was my old iPhone. 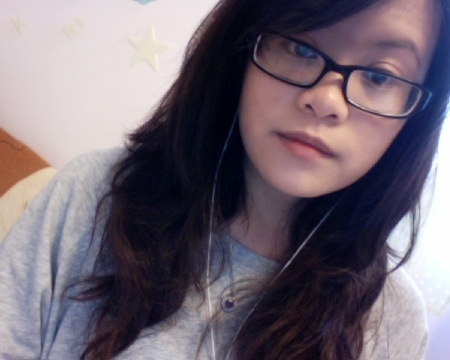 I remember that I used to have clear skin, but I noticed that I have a pimple in between my eyebrows in the photo xD! Oh man if only my skin could be like it was back then :P! I think after this time period in my life, I began breaking out like crazy. I think it's cool that you can kind of see what my room used to look like. I used to draw a lot and I would put all my new artwork on the wall! After a while, it started looking cluttered so I would take it down. 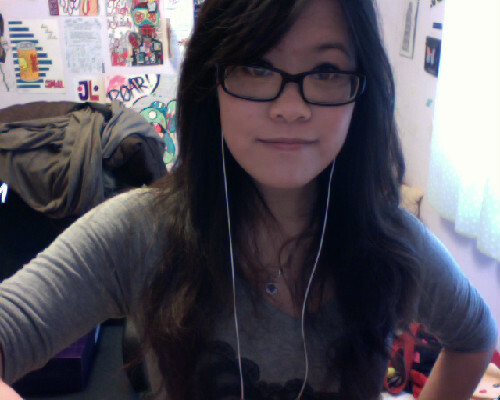 Ahh my hair looks so pretty in this photo ^______^! I like how it's all curly and wavey. I kind of want to achieve this kind of hair sometime in the future! Please ignore the failed weird dash happy face watermark attempt. I only used that as a watermark for like a week then gave up on it because it was too troublesome xD! My hair is still looking good in this photo! 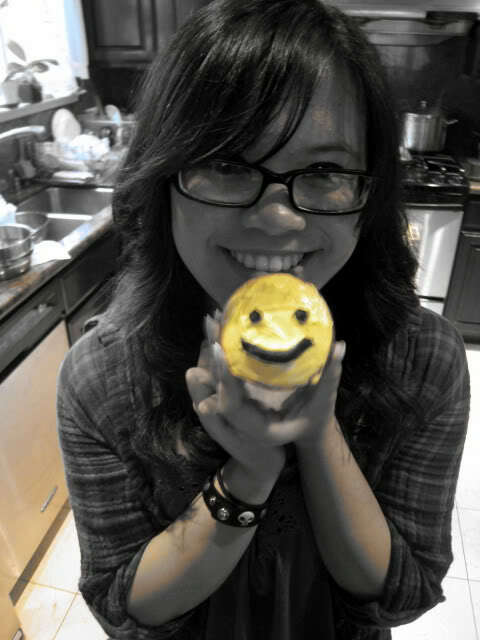 I think this was when I found out that photobooth has a sepia filter and I used it for almost all my photos. Haha I remember that I though sepia looked cool because it had that gloomy album cover feel to it. That sweater was from Forever 21! 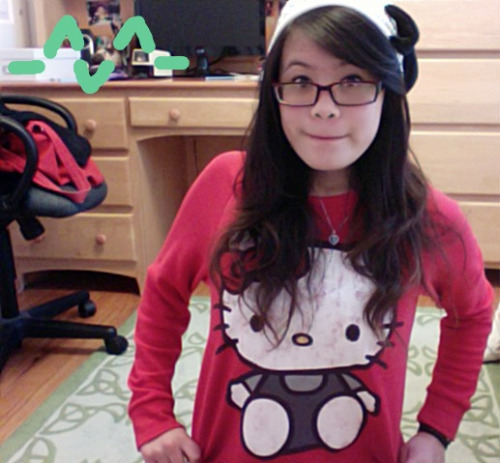 I remember because red is my favorite color and I really like Hello Kitty! I think I eventually donated it to a family friend because I out grew it. I had some good times in that sweater. I know it sounds strange to say, but that sweater was like one of my favorite things to wear back then! As you can see, I've been blogging for quite some time now. 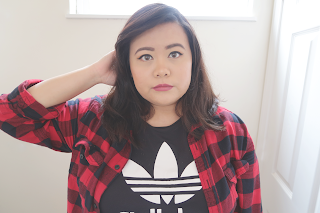 I might not have been a good blogger back then, but now I'm trying my best to improve! When I was in high school I enjoyed blogging, but I was afraid of what my classmates would think of me. Since my close friends followed me on tumblr, I was afraid they would read what I wrote and judge me for it. Now that I've grown up, I feel like it doesn't really matter what people think about me or what I write on my blog. I've always enjoyed blogging as a way to express myself. Sometimes when I don't know how to say how I'm feeling, I'll blog about it. I don't think I'll ever delete my tumblr. There are just too many memories immortalized on it! Good and bad, it's here to stay.